[The best moment of Tuesday night's presidential address? Justice Ginsburg entering the room to rousing applause and President Obama embracing her. If you weren't moved, you have no soul. If your eyes were dry, you're not human. My Mom, who has plenty of soul and is very human, couldn't say enough. According to her, Ginsburg "should get the Congressional Medal of Honor. You write that on your blog. You tell them your mother is 84 ['Nonna' is also the mother of 6, grandmother of 17, and great grandmother of 2.] and that she said it took a lot of courage for that woman to show up like that. She's giving hope to all those people suffering from that dreadful disease. I probably don't agree with her on many things [My Mom's a stalwart Republican.] but that doesn't matter. That poor thing. She's so brave. You tell them she deserves the Medal of Honor." Right again, Mom. And I just did. 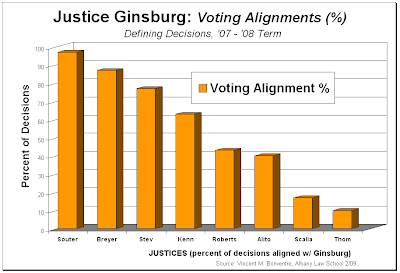 In this post we'll look at Ginsburg's voting alignments. Who she votes with in the controversial, tough, hot-button cases. How frequently, or infrequently, she's on the same side with each of the other Justices in deciding those issues. We'll also identify those "defining decisions" in which she broke ranks with her usual allies on the Court--her ideological kin--or voted on the ideologically or jurisprudentially opposite side of an issue from what is more typical for her (i.e., where she voted for the more conservative side of the issue). To start off, here's a nice little graph that, like graphs often do, shows an awful lot and makes it awfully plain. 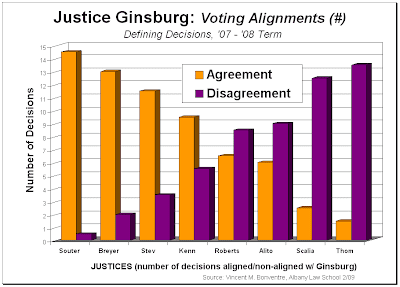 Obviously, if not strikingly, from the graph, Ginsburg has been agreeing with Justice David Souter very often, and with Justices Antonin Scalia and Clarence Thomas very rarely. 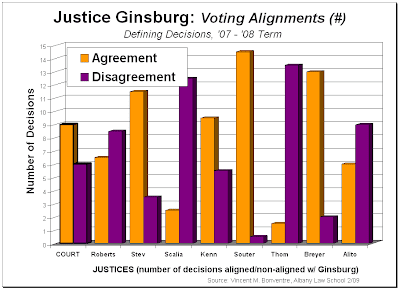 If the graph is reorganized in order of alignment with Ginsburg, from most to least (yes, descending order), the picture is even clearer--especially with regard to her other colleagues. Not surprisingly, the order of alignment with Ginsburg is identical to the Court's ideological spectrum, from liberal to conservative. (See GRAPH-ic Total Recap - Supreme Court's 2007-08 Term: The Defining Decisions (Discrimination+Cultural Issues+Law & Order+Political Process), Nov. 26, 2008.) She voted with the Justices on the Court's liberal wing (i.e., Stephen Breyer and John Paul Stevens, in addition to Souter) much more frequently than she did with those on the conservative wing (i.e., John Roberts and Samuel Alito, in addition to Scalia and Thomas). Moreover, the difference is substantial. She vote with Souter 10 times more often than with Thomas and 5 times than with Scalia. 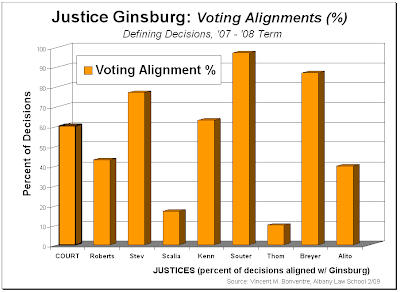 She also voted with the Breyer and Stevens twice as frequently as she did with the somewhat moderate conservative Roberts and Alito. There is simply no doubt who are Ginsburgs allies on the Court, and who are her adversaries. And then there's swing-vote Justice Anthony Kennedy who--surprise, surprise--is a mix of ally and adversary. As for adversaries, lets add the non-alignment or disagreement data to the graph. Of course, these are just the flip-side of the alignment or agreement data. But it all seems to become even more vivid when both sides are depicted. So here it goes, and this time with the actual number of "defining decisions" instead of a percentage. It helps to see exactly what we're talking about. And, again of course, the depiction of relative alignment/non-alignment is undisturbed. It's just been said, but in a different way: look at Ginsburg's non-alignment/disagreement with Scalia and Thomas. And look at how great it is as compared to her non-alignment/disagreement with Souter, Breyer and Stevens. No missing that. But let's reorganize to put it all in order again--descending order of alignment/agreement, ascending order of non-alignment/disagreement. Take a look at the climb of disagreement from Souter, through the other liberals and the somewhat moderate conservatives, to Scalia and Thomas. The climb is pretty steep. It represents the sharp differences in the Justices' overall agreement with Ginsburg. The sharp increase in the extent of their respective disagreements with her. The stark contrast in their comparative ideological conflict with her. From barely no such conflict with Souter, to more than 5 times that with Kennedy, and more than 12 times with Scalia and Thomas. Out of the 15 "defining decisions," Ginsburg disagreed with Souter in only 1. And even then it was only a partial disagreement. She was on opposite sides from Kennedy in 5 of the 15. From Scalia, in12 of them. From Thomas, in 13. It can't get much more stark than that. Finally, when did Ginsburg break ranks? When did she take a more conservative position than her ideological allies? When did she take a position at odds with the more liberal side of an issue before the Court? Not surprisingly, she didn't do so very often. Indeed, it was quite rare. Of the 15 'defining decisions," there were only 2 in which Ginsburg did not vote for the more liberal side of an issue before the Court. And in only 1 of those did she not vote for a more liberal position than other Justices. She never voted for a more conservative resolution of an issue than that taken by any of her colleagues in any of these cases. The closest she came was joining a unanimous decision for a conservative result. That was in the Lopez-Torres case. Ginsburg joined all of her colleagues in a decision upholding New York State's nomination system for "supreme court" (i.e., trial court) judges. Ginsburg might have been expected to take sides with those who challenged the system on First Amendment grounds. She didn't. But neither did any of the other Justices. In the other case, Ginsburg actually did take a position more liberal--or at least not as conservative--as her colleagues. In Moore, the Court was unanimous in holding that a state police search that violated that state's law was not an "unreasonable" search under the Fourth Amendment. But Ginsburg authored a separate concurring opinion, for herself alone, making plain that the Scalia-written Court's opinion took too broad a position. For her, the case turned on the narrow ground that the state itself would not exclude evidence for a violation of its own law. For her, a state law violation was not so clearly and unqualifiedly disconnected from an "unreasonable" search. So although her vote sided with the prosecution and not the accused, her position was somewhat more liberal--and less conservative--than that of her colleagues. In any event, Lopez-Torres and Moore were the only 2 cases out of the 15 "defining decisions" in which Ginsburg voted for the conservative resolution of the issue before the Court. And in Moore, as we've just discussed, she took a position less conservative than the rest of the Justices. Stated differently, Ginsburg never took a position in any of the 15 "defining decisions" that was less liberal--or more conservative--than any of her colleagues. Her vote was the most liberal--or one among others that were equally liberal--in every one of those cases. Well, that concludes this 3 part series on Justice Ginsburg. In previous posts we've looked at Roberts and Stevens, and we began to look at Scalia and Thomas together. (The New York Court Watcher then turned for a while to the nomination and confirmation of New York State's new Chief Judge, and then to Justice Ginsburg when she became ill.) The next several posts on the Supreme Court will finish the examination of Scalia's and Thomas's voting records, and then look at the records of the remaining Justices: Souter, Breyer, Kennedy, and Alito. Till then, God bless Justice Ginsburg and may she be well. And the same to all of you.